Head to Baker Lake in the Mt. Baker–Snoqualmie National Forest for a low-key weekend away from it all. Many of the more than 250 sites in the 10 campgrounds that dot the shores of Baker Lake come equipped with water access and killer views of Mount Baker or other surrounding North Cascades peaks. Swift Creek Campground can feel crowded, but more privacy can be found at Horseshoe Cove, Shannon Creek and Panorama Point campgrounds. While a lonely mountain tarn it’s not—motorboats abound on this lake turned reservoir—Baker Lake is a great place to cast a line, paddle a kayak or go for a swim. To reserve a site (from $14/night), go to recreation.gov; for information call the Mt. Baker-Snoqualmie National Forest office at 800.627.0062. Baker Lake, near Concrete, is about a two-hour, 15-minute drive north of Seattle. Located on and around a sand spit jutting out into the Salish Sea from Lopez Island, Spencer Spit State Park is one of the state’s go-to spots for recreational crabbing, clamming, fishing, swimming and wildlife viewing. With more than 35 tent sites and two primitive restrooms (sans showers), glamping it is not. 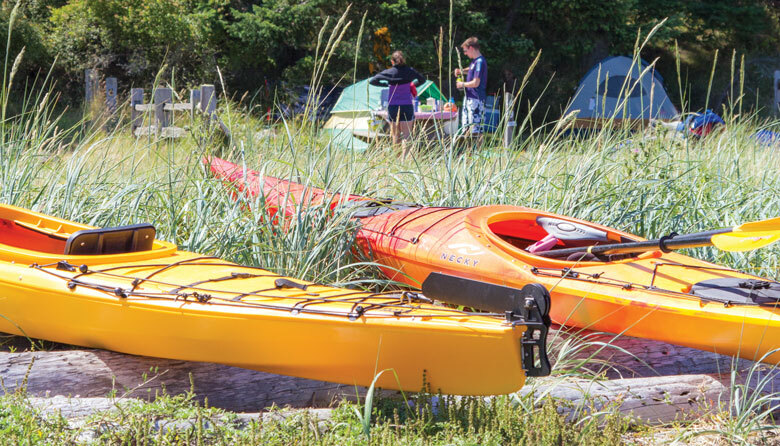 But most of the campsites are spacious and private—and how else can you afford waterfront property in the San Juan Islands, even if it is just for one or two nights? To reserve a campsite ($20–$45), call 888.226.7688 or go to washington.goingtocamp.com. Lopez Island and Spencer Spit are accessed via a Washington state ferry from Anacortes, about a one-hour, 30-minute drive north of Seattle; total travel time with ferry ride is about three hours. Waterfall lovers will love spending the night camping within earshot and eyeshot of Palouse Falls, the official waterfall of Washington state (an honor bestowed on the 186-foot cascade by the state Legislature in 2014 at the urging of elementary school students). Tucked into eastern Washington’s high desert plateau and located in Palouse Falls State Park, the cataract is worlds away from Seattle. Snag one of the 11 campsites set back from the edge of the basalt canyon directly across from the waterfall and revel in its glory. While anyone can make it to the paved, handicapped-accessible overlook across from the falls, hikers can head out north from the parking area on a gravel path that intersects in a third of a mile with a trail heading east and down into a small side canyon with views directly across to Squaw Falls, where the Palouse River drops 20 feet in a warmup for Palouse Falls, another 1,000 feet downstream. Campsites ($25–$45) are first come, first served; get more details at parks.state.wa.us. Palouse Falls, in the southeast corner of the state, is about a four-hour drive from Seattle. Deep in the Gifford Pinchot National Forest, this shady, rustic 43-site campground (no hookups) gets you up close and personal with the scenic Lewis River and its gorgeous waterfalls. Leap off the rocks into the turquoise water below, then hike the lovely 7-mile loop to Middle Falls and Upper Falls, where you can do it again. Don’t want to get wet? Try fishing for catch-and-release trout, or grab your mountain bike and hit the trails. To reserve a site ($15/night), go to recreation.gov/camping. The Lower Falls are about a four-hour drive southeast of Seattle. Millersylvania giant old-growth cedar and fir trees shade this pretty 120-tent campground (plus 48 utility spaces) in Millersylvania State Park. Situated on the shores of small, serene Deep Lake, the park has boat rentals, trout fishing and a beach for swimming, plus 16 miles of hiking and biking trails nearby. The campground’s coin-operated showers make roughing it a breeze (even better, book one of the “glamping” tents), and Olympia’s fantastic farmers market is just a short drive away, ready to give your campfire cooking a boost. Reserve a campsite ($30/night) at parks.state.wa.us. Millersylvania, near Olympia, is about a one-hour, 40-minute drive south of Seattle. Located on the north flank of Oregon’s Mount Hood in the Mount Hood National Forest, this rustic resort offers 148 well-spread-out campsites, plus cabins, yurts and lodge rooms. Paddle around the jewel-like lake, or walk the 3.2-mile loop, but be sure to stop on the northern end for an iconic, postcard-perfect view of the majestic mountain and its watery reflection. Six more trails, some with sweeping vistas, keep bikers and walkers busy, and the general store has everything you need, from ice cream, boat rentals and fishing poles to a nice hot shower. Reserve a campsite (from $29) and other accommodations (from $70) at reserveamerica.com. Lost Lake, east of Portland, is about a four-hour, 30-minute drive from Seattle.